We are having a silent auction at work for charity so I've been putting some things together to donate. 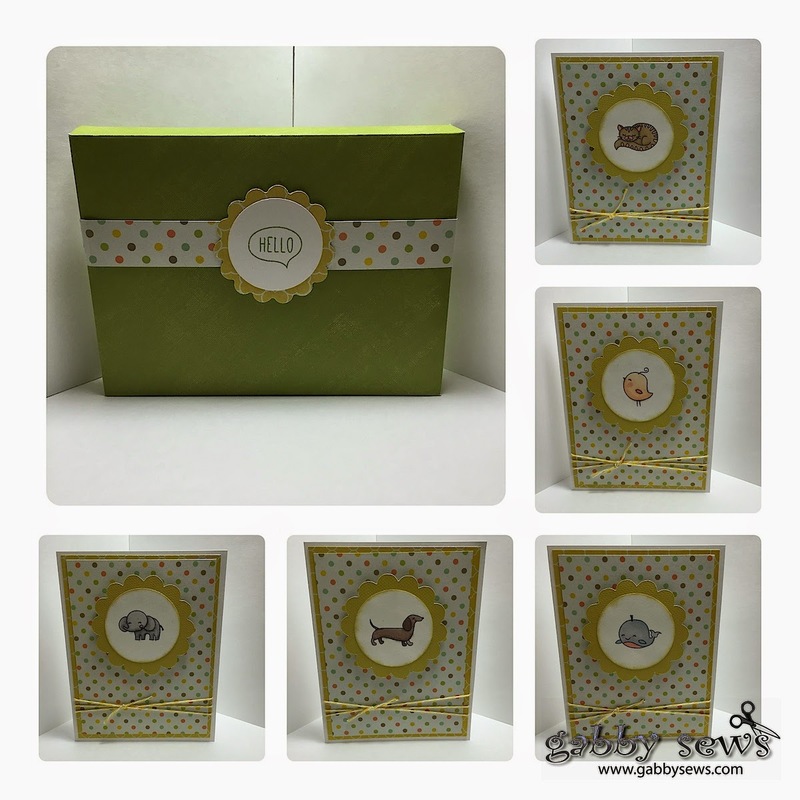 I created this set of five A2 sized blank note cards and a card box. The background papers on the cards are from a We R Memory Keepers paper pack called Simply Spring. I stamped the critters from the CTMH Cuddly Salutations stamp set in Momento Tuxedo Black and colored them in with Copic markers. I cut the scalloped circle (circle3) with the Art Philosophy Cricut Cartridge at 2.75" and I punched the white circles out with a Fiskars 2" circle punch. The card box is made using the envelope punch board. The paper is cut at 9" square and punched at 3.5" and 4.5" on opposite sides and then just match up the score lines on the other two sides. The paper is from a Paper Studio stack called Glasses, Staches, & Ties. I created the belly band with some scraps from the paper I used to make the cards. The sentiment is from the same stamp set as the critters and it's stamped in CTMH Pear ink.